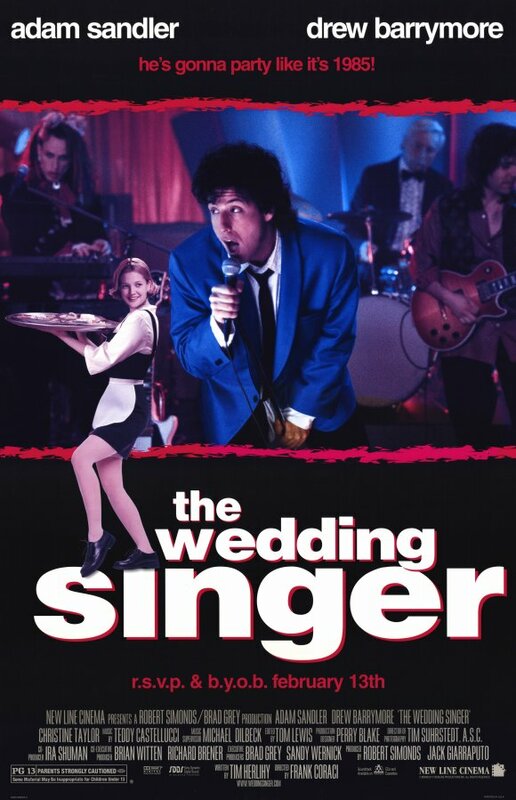 The Wedding Singer. New Line Cinema 1998. So, romantic comedy? Adam Sandler and Drew Barrymore? Doesn’t sound like anything special. On the surface, I don’t understand why this is something of a cult favorite. I find the tagline (various turns on “he’ll party like it’s 1985”) more annoying than anything. I’m not clear on if the story is actually set in the 80s or if it’s just the aesthetic Sandler’s character and band go for. It doesn’t seem to have any reason to be set in the 80s (again, from the outside looking in). This has the potential to be a less annoying Adam Sandler character than I usually think of. A romantic lead who performs at weddings doesn’t sound like a character that would lend himself to being particularly weird or manchildish. Drew Barrymore is always welcome on my screen. I think I won this in a random draw at work on a big retail day last year. I considered reselling it since I wasn’t very interested in it, but then I realized I could blog about it, and here we are. Robbie Hart is the best wedding singer in town, but since he works for peanuts and gives favors, he’s dirt broke and living with his sister and brother-in-law. He’s also getting married, but his career instability drives his fiancee Linda to decide not to attend the wedding. Heartbroken and cynical, Robbie swears off working weddings. However Julia, the new waitress at the banquet hall has finally convinced her fiance Glenn to set a date, and as he’s refused to offer any input on the wedding plans, she needs help navigating all the logistics. Robbie is an expert at weddings, and agrees to help her plan her wedding. Over the course of the three months until the wedding, Julia gets Robbie out of his jilted funk, and they grow close. As they inevitably draw each other in, Glenn obligingly turns out to be a slimeball, but the wedding draws near and Julia and Robbie need to realize their feelings for each other, each other’s feelings, Glenn’s failings, and the usual package of rom-com problems. I didn’t care much for Drew Barrymore’s hair in this movie. Yes, it’s the 80s and everyone has hair that’s aesthetically unpleasing today, but most of the bad hair was just big hair. Her hairstyle could have probably passed in the late 90s better than anyone else’s, so I’m not sure what my issue is with it, other than that I’m used to her having longer hair. The way it framed her face may not have been flattering. Nobody else’s hair was really an issue for me, it was just 80s hair. I’ve talked too much about hair. It’s a problem pretty much every romantic comedy runs into, but even though the movie attributes the idea of thinking of women as property to the “villain”, the plot structure treats Julia much the same way. Robbie’s character growth is about getting over his breakup and learning to be happy again. Julia’s arc is about realizing she’s with the wrong man. It spends a lot of time asking what she wants, but ultimately, the decision is made for her. In a way, making her fiance a pig negates her side of the story. While it’s good to have a legitimate reason for the protagonists’ partners to deserve to be rejected, going too far as with Glenn makes the audience wonder why they’re still together at all. I thought Linda was a more believable partner, but that’s mainly because she’s less character and more plot device. The story starts when she leaves, and later she comes back at the right five minutes to ruin everything before disappearing again. I really liked Robbie as a character. He’s funny without being a goofball, and often very clever. I would have liked to see more of his tact and wisdom, as seen with the Best Man at the opening wedding, the kid who couldn’t hold his liquor at the same wedding, and the kid at the bar mitzvah. This side of him also comes out with Rosie, but even that doesn’t get as much time as I’d have liked. Why couldn’t Adam Sandler do more of this instead of Zohan? Meanwhile, Jon Lovitz completely steals the show in one very short scene. If the movie had been made today, his character would have a spinoff three years later. This doesn’t quite have the magic of L.A. Story, but it pops in a way that not many romantic comedies do. I’m still not sure the 80s stuff was a good idea, since it’s either so far in the background I barely notice or a huge, in your face historical in-joke. Maybe I would have taken to it better if I’d lived through the 80s. The protagonists are relatable, entertaining people, and their sidekicks are fun without being aggressively wacky. The stock mad dash to the airport even makes more sense than usual, since Robbie actually gets close to Julia in a way that wouldn’t have him tased and handcuffed in this decade. Watch this movie: with nostalgia glasses on. Don’t watch this movie: in a pile of generic rom-coms. Previous Article What about Bob?